Whether our kids are working on Engaged Learning Units (ELUs), cooperative learning, or finding their place in our family units, they are constantly being asked to work together with others. Finding books that help them see what teamwork, friendship, and unity look like is a great way to encourage our kids in their work and relationships. 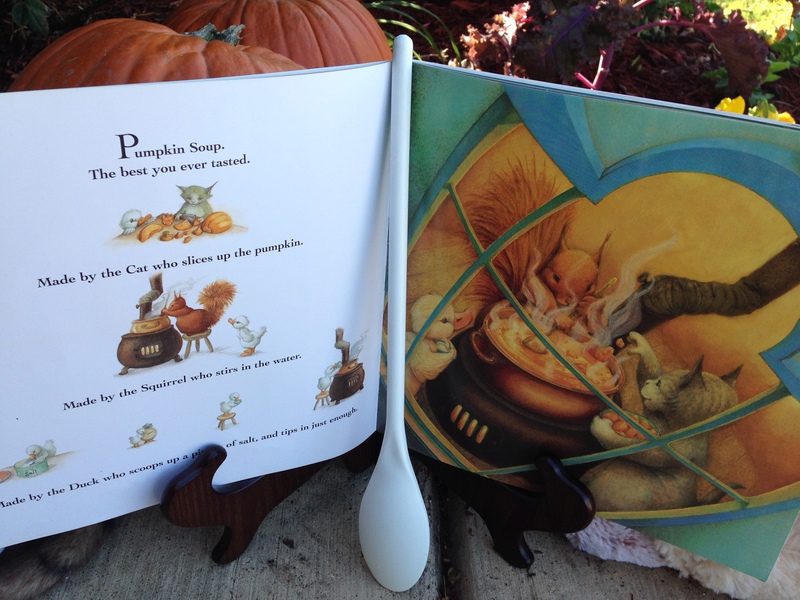 Pumpkin Soup is one of my FAVORITE books ever and accomplishes this endeavor sweetly. with pumpkins in the garden. There’s a good smell of soup . . . The best you ever tasted. Made by the Cat who slices up the pumpkin. Made by the Squirrel who stirs in the water. Made by the Duck who scoops up a pipkin of salt, and tips in just enough. This trio seems happy each doing his own job, until . . . the Duck decides HE wants to use Squirrel’s spoon. He wants a turn at being the Head Cook. After a tug-of-war between the Duck and Squirrel, the spoon flies through the air and hits Cat on the head. 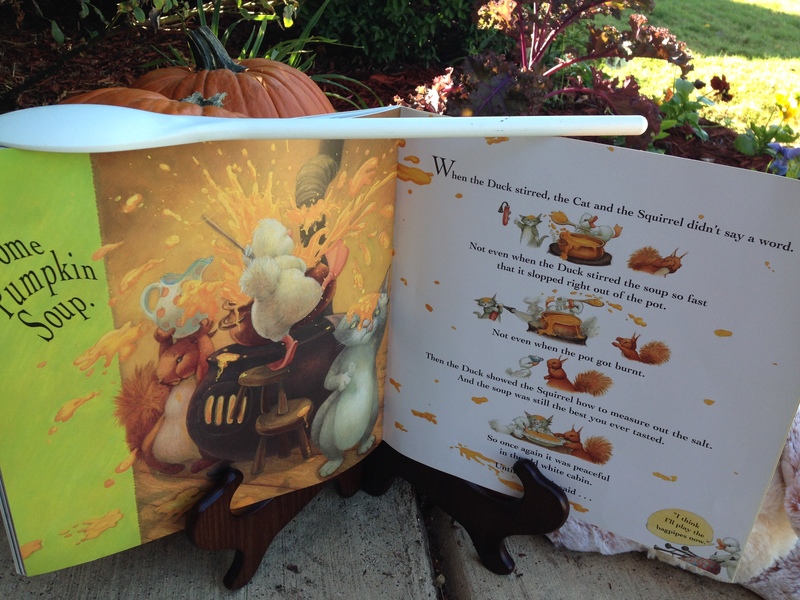 “We should have let him stir the soup,” sniffled the Squirrel. “He was only trying to help,” wept the cat. 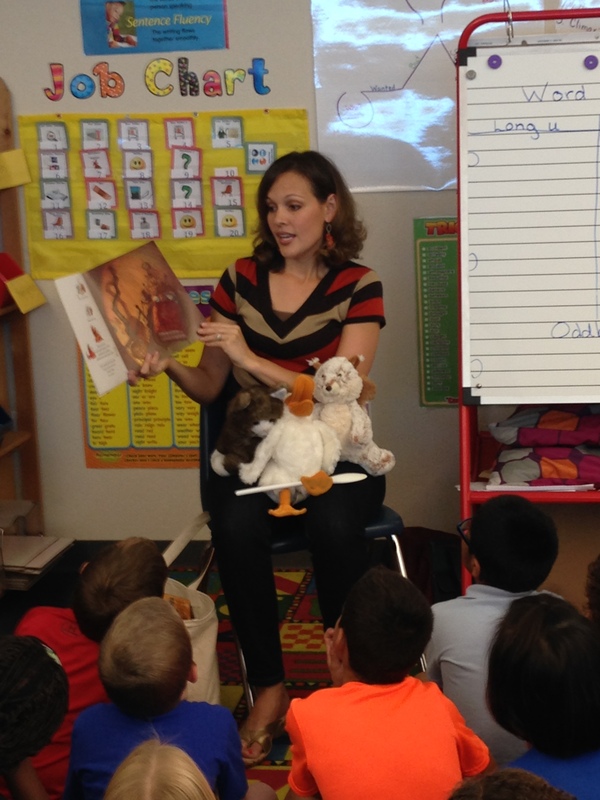 Fearful for the Duck, they set off into the dark woods to rescue him, but couldn’t find him. Concluding that Duck may have found better friends, they return home even sadder than when they had set off. Their hope is renewed when they near their home and see the light coming from their cabin window! Duck is happy to see his friends again and even though it is late, they celebrate by making . . . Pumpkin Soup. Duck gets a chance to use the spoon, and he teaches Squirrel how to measure the salt. . . And even though Duck stirs too fast, spilling the soup out of the pot, the soup is the best they ever tasted. What a great story to share with a class before doing an ELU or with your family as you try to teach your kids to kindly compromise and be considerate of their siblings. Next time they are tempted to “stir the pot”, they may remember how much better life is when they work together as a team! F- How do you feel when a classmate or sibling gets to do the job you want to do or gets the part in the school play that you wanted? How can you best handle these situations? R- Which character can you best relate to: Duck, who wants to try something new, Squirrel, who doesn’t want to share his favorite job, or Cat, who is caught in the middle of two friends? Tell your experience. I- Imagine that you are one of the characters in this story. How would you feel experiencing the events in this story from his perspective? N- Navigate through some soup recipe until you find the one that hits the spot. D- Develop a project (cooking, cleaning, creating) where three or more friends or family members come together to make or do something special for another person. Develop a plan of how to accomplish this job as a team and get started! S- Share your favorite part of this book and tell why you like it. 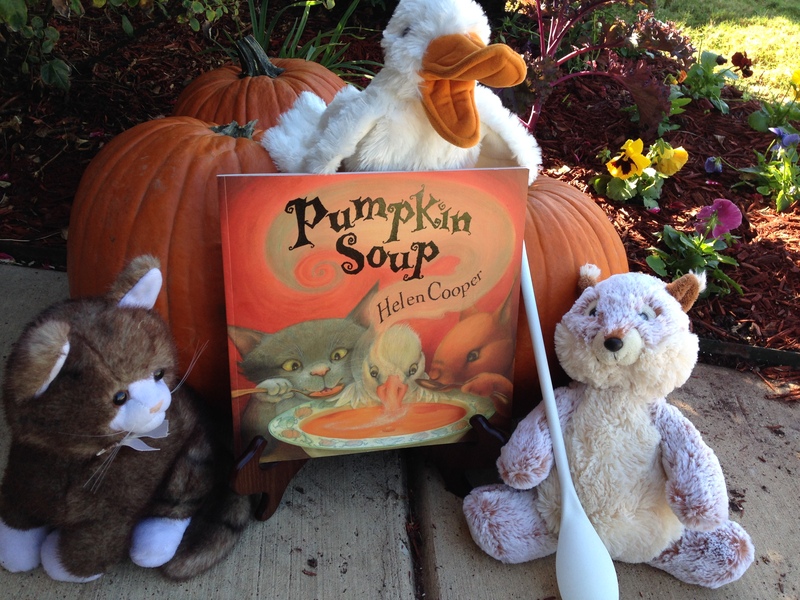 Enjoyed sharing Pumpkin Soup with my son’s third grade class. Cat, Duck and Squirrel loved meeting them too! and visit http://www.kidsbookfriends.com to subscribe via e-mail. 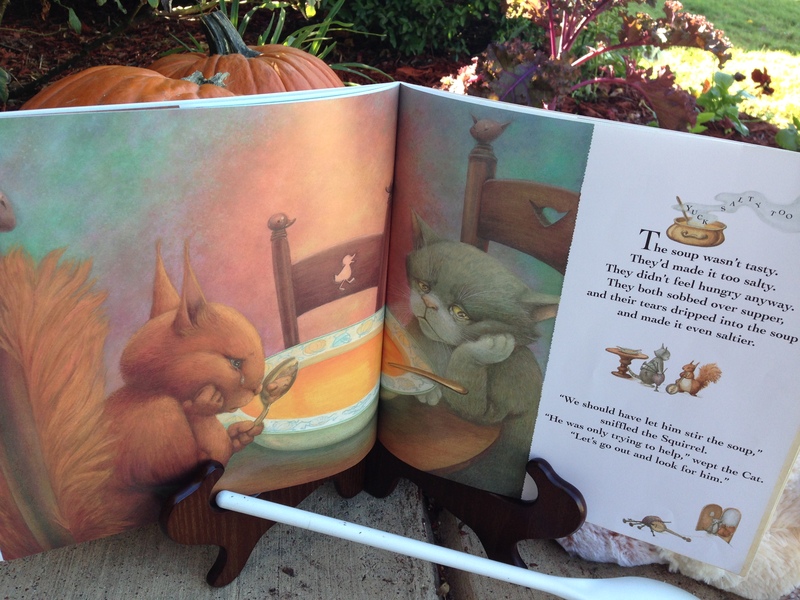 This entry was posted in fall, garden, Halloween, Mealtime and tagged children's books for autumn, children's books for fall, children's books teaching teamwork, children's books with a cat, children's books with a duck, children's books with a squirrel, Farrar Straus Giroux, Helen Cooper, Pumpkin Soup. Bookmark the permalink.